Situado en una granja de carne de vacuno que trabaja en una calle tranquila y recientemente convertida a una alta especificación con calefacción por suelo radiante respetuoso del medio ambiente, gran salón / comedor con estufa de leña y una zona de cocina totalmente equipada, dos dormitorios (uno doble y una individual), cabina de ducha y baño completo. Cuna / trona disponible bajo petición. Separar lavadero totalmente equipado. sala de estar se abre directamente al patio con vistas a los campos abiertos y de preciosos campos. Un montón de espacio al aire libre para los niños para jugar. Adecuado para niños para ayudar a alimentar a nuestros animales más pequeños (cabras, ovejas, gallinas, terneros). Hasta dos pequeños perros bien educados son bienvenidos. Un montón de paseos directamente de la propiedad en calles tranquilas, pistas y caminos. Los mapas y consejos sobre paseos disponibles bajo petición. Wifi, TV / DVD. El pueblo local de Horsley dentro de los 15 minutos a pie con gran familiar galardonado pub (con una comida y noches de música semanales) y la tienda del pueblo organizado por la comunidad. Pueblesito mercado de Nailsworth fácilmente accesible a pie o ofrece aparcamiento gratuito con una gran cantidad de interesantes tiendas independientes y cafés / restaurantes e información turística. El fácil acceso a todas las atracciones de Cotswolds, 30 minutos, 40 minutos Cheltenham, Bath y 40 minutos. mercados agrícolas locales en Nailsworth y Stroud mensual. Moderno y espacioso. Gran cabina de ducha. We have just come back from a 4 night stay at Swallows rest. The accommodation is fantastic, spotlessly clean, lots of space both inside and out, and the welcome cake, fresh eggs, tea, coffee and milk were a really nice touch to make you feel welcome. My children were up and dressed by 8:30am ready to feed the chickens and goats, and to collect the eggs. Jeannie and Brian were fantastic with the children and showed a great deal of time and patience with them. The farm is in a beautiful part of the country, with lots of nice walks on the doorstep. Thank you Zoe for your lovely review. It was a pleasure to meet you and your family and we are always happy to entertain and involve our young guests in the world of farming. We hope to welcome you back soon! Beautiful place and a fabulous stay! Clean, spacious and perfectly appointed holiday cottage in a stunning location. The hosts are very welcoming- the homemade cakes were a lovely touch. Staying on the farm was great and the kids loved seeing the animals. In a great location to explore the various local walks, great local pubs or explore the Cotswolds. Child and family friends- would definitely recommend! Thank you Sophie for your lovely review. We are so pleased you enjoyed everything about Swallows Rest and what we provide here for our guests and hope to see you and your family here again! From the moment we arrived we felt Welcomed and relaxed. The farm is well positioned for day trips exploring the UK and on days we where to tired to explore, we had lots to do on the property from feeding animals, playing tennis in the fields and board games in front of the fire. Jeannie and Brian are very welcoming and are a great resource for local activities and sight seeing. We stayed for two weeks and it’s the first time on holidays we didn’t want to go home. Thanks Jeannie and Brian for sharing your farm with us. Lots of lovely family memories made. Thanks Brett and Tricia for your great review! It was a pleasure to have you all as guests at Swallows Rest and we are pleased you enjoyed your stay with us so much. We look forward to seeing you again when you are in the UK! Excellent- very well appointed and a great layout with plenty of living space. We had a great time at Swallows Rest. The property is great and we really enjoyed being on the farm, particularly our three year old daughter. Jeannie and Brian were very friendly and welcoming without being in our faces. The house is very well appointed and laid out such that there is plenty of living space, rather than packing in bedrooms. The property makes a great base from which to explore the Cotswolds. We would heartily recommend it. Thank you Rupert for your great review. We are so pleased you enjoyed your stay at Swallows Rest and look forward to seeing you again soon! Spacious and warm! Lovely hosts. We had a lovely long weekend in this house. The house is a converted milking parlour, spatious, comfortable and warm. It had everything we needed.... every detail was taken in account. It has a closed field just in front of the house so we could take the dog for a quick wee in the night and early morning. 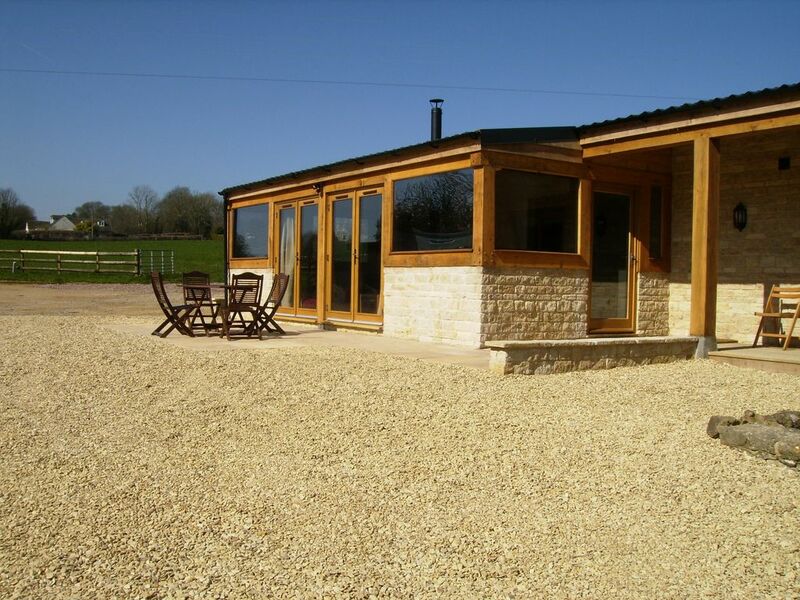 It's in a gorgeous location, a farm, near several trails and walking distance from the pub. Jeannie and Brian are great hosts, they were always available to help. They left us coffee, tea, milk and cake which was deeply appreciated. They also advised us on multiple trails. We will repeat next year, I recommend this house 100%. Many thanks to Jeannie and Brian! Many thanks Jessie for your fabulous review. We look forward to seeing you all again at Swallows Rest in the Spring! Somos una granja de ganado que trabaja. Los niños son bienvenidos para ayudar a alimentar a los animales más pequeños y para recoger los huevos puestos por nuestros pollos. No dogs to be left unattended in the property at any time.